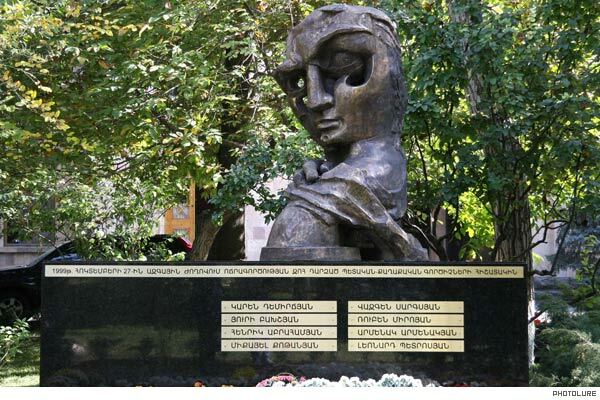 The memorial devoted to the victims of October 27 (1999) tragic events at the National Assembly. The unveiling of the memorial was reserved for Karen Demirchiyan’s widow Rima Demirchiyan and Vazgen Sargsyan’s mother Greta Sargsyan. “This memorial should have been erected long ago, and not only ten years after, however, we are very thankful that it is done now. The crime committed on October 27, 1999 left an unforgettable and incurable injury in the history of our statehood,” said Rima Demirchiyan. Yuri Bakhshyan’s widow Anahit Bakhshyan, now a member of the opposition Heritage Party, stated that the crime of 1999 broke the spine of the Armenian statehood. The case of October 27 is closed, however she has not got the answers of many questions up to now. The Armenian National Congress (ANC) made a statement which says that the crime of October 27 continues up to now. “The violence of April 12, 2004, as well as the heinous massacre of peaceful demonstrators on March 1, 2008 peaceful demonstrators, the shameful Zurich denial of the Armenian Genocide, and Nagorno-Karabakh, which is on the verge of ruin, are born from it (October 27),” the statement says. Stepan Demirchyan, head of the People’s Party of Armenia, says that the authorities did nothing to prevent the crime; however, everything was done to hide it. “It is impossible to get an entire revelation while the current authorities are in power. However, sooner or later the reality will be disclosed. This is a matter of our statehood’s dignity. Only in case of having an entire revelation we will be able to overcome the negative consequences of the October 27 events,” says Demirchyan.